Johnston & Murphy have been manufacturing the finest quality men’s dress shoes since 1850. They continue to evolve their style, craftsmanship and design innovation, delivering contemporary men’s shoes which bring a blend of classic style and modern convenience. The Johnston & Murphy Men’s Conard Cap Oxford has set a great standard, giving you a reliable pair of shoes with distinct American styling, faultless in their design and durability. From the heightened heel to the Italian calfskin upper, these imported leather Oxfords do not disappoint. A comfortable fit combined with modern aesthetics, the blend of a brown sole and brogued toe cap guarantee a striking look. Available in three different colors and delivering exact-fit sizing, you won’t be disappointed by these excellent dress shoes from Johnston & Murphy. This long-running manufacturer of superior men’s footwear has delivered yet another fine example of what makes them such a trusted brand. Despite their exceptional styling, these shoes from Johnston & Murphy are simple enough to be worn with almost any form of formal or semi-formal attire, while even matching most casual clothing as well. These men’s Oxfords look as if they could cost up to three times the price they retail for. You’re guaranteed the perfect highlight to your outfit, while each pair will give you lasting comfort. Here we’ll be taking you through the best features, pros, and cons of these outstanding men’s dress shoes. Johnston & Murphy have utilized only the highest quality genuine leather in their manufacturing of these excellent oxfords. The shape is great, the leather is stiff but comfortable, and the colors available should match almost anything in your wardrobe, regardless of whether it’s casual or formal. The stitching of the Johnston & Murphy Men’s Conard Cap Oxford is truly top notch. The quality of craftsmanship is clear, while the stitching is well-designed to highlight the curves of this sleek dress shoe. There is virtually no break-in period, with these shoes adjusting to the form of your foot within hours. Comfortable straight out the box, you will also find that they hold their shine extremely well. Another great feature of these reliable Oxfords is the two different types of shoe laces supplied. Standard black and a dark blue are given with each pair, allowing for you to switch out your laces depending on where you plan to wear them. The blue creates a great contrast, accentuating the sleek lines of this stylish dress shoe, while black is, of course, the most versatile. Both color schemes of the Johnston & Murphy Men’s Conard Cap Oxford deliver elegance and class. The combination of a brown sole and stitching with the black or tan leather creates a striking look which will match even the most contemporary formal dress style. It suits jeans just as well thanks to not being overly embellished. You will find that even though the shoe is best suited to a low instep, the fit is tight and secure regardless of your foot type. The rubber sole gives great slip-resistance, while the arch support ensures comfort no matter how long you’re wearing them for. The leather is slightly softer than most competing shoes of this style. 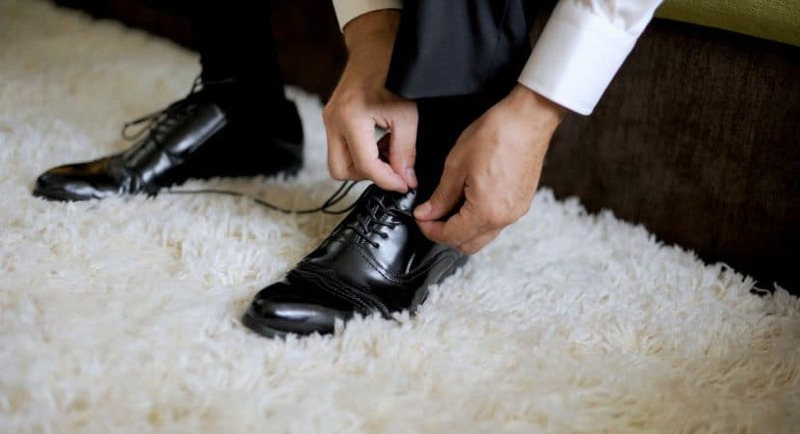 When combined with the lightweight design and unbeatable arch support you have a pair of men’s dress shoes which deliver complete comfort to every area of your foot. Unfortunately, these shoes cannot be re-soled. They can, however, have a new heel fitted, despite the stacked heel being rugged and durable. Fortunately, the top-rate durability gives you a pair of shoes with soles which will last. The traction does not wear down easily, and the memory foam cushioning retains its comfort levels even after long periods of use. The closest matching shoe style to these Oxfords from Johnston & Murphy are those supplied by Cole Haan. Yet given the massive price difference and the near identical quality, these Oxfords are clearly the best choice. They equal the quality, looks, and comfort of far higher priced shoes, with the aesthetics being easily mistaken for shoes which cost up to twice as much. Many compare the comfort level to that of wearing sneakers, while others have reported that they are actually more comfortable than even tennis shoes and similar sporting footwear. The memory foam cushioning is far superior to other shoes in its price range, while the fit itself could not be better. The tongue wraps securely to the form of your foot, never allowing for any movement in the shoe itself. You will find that the instep is slightly taller than comparable shoes from manufacturers such as Melton and Allen Edmond Park, which is yet another enhancement that ensures a superior level of comfort. The shape of these shoes make them very versatile in regards to which foot types they are suited to. Regardless of what shape of foot you have, you’re ensured a tight, form-hugging fit with enough room at the toes to never cause discomfort. Both the black with brown sole and the tan varieties are stylish shoes which deliver value for their affordable price. It will be difficult to find a pair of dress shoes in the price range that can compete with the Johnston & Murphy Men’s Conard Cap Oxford. Thanks to the intricate, attractive patterning and the multiple joins, these shoes are set to give you good service without prominent creases forming anytime soon. The only questionable quality is the rubber heel; however, due to being lined with leather it’s far better than many similar design shoes. Slip-resistant, comfortable enough for daily use and elegant enough for formal functions, this is a pair of men’s dress shoes which does not disappoint. What Are Dress Pants Made Of?